For some time now, America has done all it can, to destroy the poor; denying them decent housing, healthcare, access to nutritious foods, a quality education, and making it more and more difficult, for them to improve their lives. In the 60s, the poor were seen as valuable enough to society, to be helped to rise up out of poverty. Do you think that the poor will ever again be considered valuable enough in society, to be truly helped to escape poverty, once and for all? For some time now, America has done all it can, to destroy the poor; denying them decent housing, healthcare, nutritious foods, a quality education, and making it more and more difficult, for them to improve their lives. In the 60s, the poor were seen as valuable enough to society, to be helped to rise up out of poverty. Do you think that the poor will ever agian be considered valuable enough in society, to be worthy of being truly helped to escape poverty once and for all? Ya, that's right, America (whatever "America" means - you didn't define it: society? government? the media? what does "America" mean?) trys to destroy the poor. That is an objective. "How can we screw the poor this week?" What evidence do you have that the America "treats" the poor any differently now than it did then? I'd be willing to bet people on the lower socio-economic ladder today have better access to healthcare, are more highly educated, have a higher standard of living, and live longer lives than those same people would have in the 1960s. People on welfare today have cell phones and internet service, drink starbucks, drive big cars, and have kids that go to college. Last edited by Charles; 03-04-2011 at 08:59 AM.. Ya, that's right, America (whatever "America" means - you didn't difine it: society? government? the media? what does "America" mean) trys to destroy the poor. That is an objective. "How can we screw the poor this week?" First of all, you know what I mean by America; which is the USA. Don't know if you were alive or not during the 60s. If you weren't then you should read-up on how society was back then. When Lyndon Johnson was President in the 60s, he set about crafting a host of anti-poverty programs, to help the poor thrive. The poor were seen as human beings then, and worthy of help to overcome their poverty. I think that what you don't understand is how many programs like that exist but because they can get coin without doing anything, many have decided to take the path of least resistance (just cut 'em a check...forget the work). You need to go work with poor people...there are all kinds...and, btw, they are all doing much better than the poor almost anywhere else in the world. What YOU don't understand, is that the anti-poverty programs of the 60s, were meant to lift the poor out of poverty. Now, they don't want to do anything to give the poor, a real chance to escape poverty, such as improve our public education system. You can't compare the US, to third world countries. It's like comparing apples to oranges. The US has the resources, to help people escape poverty. The third world countries don't. That being said, why should the poor be stuck in substandard housing, in neighborhoods where they have no access to nutricious food, and going without basic healthcare, and other life necessities?? In a country like America, allowing these things to happen, is morally reprehensible. No access to nutritious food? That's just about impossible. The county provides free healthcare (at least it does in Los Angeles County). And who are the poor? How many kids do they have? What are their average education levels? What percent have criminal records?How long have they been speaking English? How may of their dads still live at home with their kids? 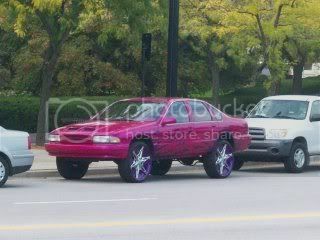 What do they do with an extra $300: Invest it in a mutual fund or buy new fancy rims for their Impala? I can think of two reasons for the current situation. First, the programs of the 60's didn't work, they didn't solve the situation. Instead, it created an attitude of entitlement amongst those collecting from those programs. And not only that, but the children of those recipients grew up expecting the same government security blankets. Landlords have posted on this board about encountering third generation Section 8 tenants. And with the advent of welfare, there was no incentive for single women getting accidentally pregnant to get married. They think that it's better to not name the sperm donor of their baby and get "free" money from the government instead. So these programs are not helping people get out of poverty, they are just crippling their true potential by allowing them to underachieve and coast on government handouts. These government programs just help the poor become skilled at playing the system to maximize on handouts. Secondly, since our US economy is in a depression and our federal and state governments are all running in the red, they just isn't anymore money to throw away on programs that don't work. Plenty of poor people make it out of poverty, and without any handouts from our governments. It just requires hard work (perhaps even working several jobs at a time) and a dedication to being focused on their goals (and that means not spending money on nonsense bling to impress their friends). Look at how most big lottery winners who were chronically poor to begin with end up after a few short years of their big win, the lucky ones end up with just spending it all within a few years, but the majority of them end up with huge debts. The chronic poor just don't know how to manage their money. And there is plenty of access to nutritious foods. It's a matter of not being lazy and eating out at fast food restaurants. Cook at home. Cut out the fried foods, cheeseburgers, pizzas and don't eat the chicken skin. Cut out soda and drink water instead, which also happens to be free. Bring a water bottle from home instead of buying a can of soda. And from reading the UE section of this forum, too many feel entitled to collecting the maximum benefits allowed and for as long as possible. And they also seem to feel entitled to find another job identical to their previous one and at the same pay rate. But unfortunately, there are no guarantees in life regarding the job market or any market, whether it's real estate or the stock market. And what goes up, inevitably goes down. I think that my college economic professor pointed out in class that in the long run, between the ups and downs, it all breaks even in the end. In this economy, we all have to learn to live sensibly and frugally. Even when the economy is strong, smart people still live frugally. A person's value to society comes from what they give back to their society, not by virtue of their mere existence. There are poor people who make the world a better place and rich people that are totally worthless and vice versa. A person's "value" to society is not based on their income. It's what they do with what they've got. That is up to the poor. If they find a way to market their skills, then yes.